Website design packages made for businesses depending on what you need! 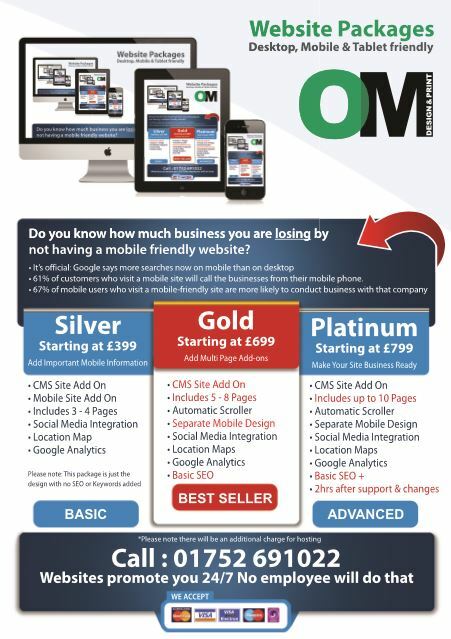 Our OM website design packages have been specially designed to meet the needs of all new and existing small businesses. Your website will include everything you need to get your business online as well as make the most of your website once it is launched. We’ve streamlined the process from commissioning your website to getting it online so not only can we deliver your site quickly, we can do it at price your business can’t afford to miss. Take a look at our web design rate card. What does that mean? It means that when we build your website we also build a separate mobile platform which will enable google to find your business with ease. It also means users will be able to navigate around your website using an adapted viewing platform giving the user a chance to engage with your site for longer. We’ve made sure the content management system is really simple to use. You can log in from your computer, tablet or phone and easily make changes to your text and images. It’s actually much more than just a management system, it’ll also prompt you from time to time with helpful tips based on best website practice helping you get the best results from your site. Your website comes complete with a fully responsive design. What this means is that your website’s pages will adapt to fit perfectly on whatever device they are being viewed on.